For an artist whose name is together in an interesting readily associated with all kinds of fantastical vistas, it’s rather ironic that Roger Dean’s cover to Close To The Edge is a masterclass in understatement. “The texture on it was meant to feel like a leather book cover. I’ve got hundreds of dark green leather-bound sketch books, and I quite liked that look and feel. I also wanted it to have some memory of that idea of creating a book that we did with Fragile. The common wisdom among advertising and art directors is that green won’t sell, but I thought it might! “After Fragile, I felt Yes needed a logo and designed it without talking to them. For all I knew they weren’t even going to come to me for the next album, but I still designed this logo. I did it over the course of a train journey to Brighton. I started with a notion that you can put these three letters together in an interesting way and by the time I got to Brighton, I’d pretty much done it. If Close To The Edge was the soundtrack, opening the gatefold album sleeve on Dean’s spectacular landscape provided the cinematic experience to go with it. “It came with wanting to paint a world that was magical and miniature and impossible but totally credible. “I was painting landscapes to look real and, in the most literal sense of the word, enticing. I wanted them to pull you in and make people want to imagine what it would be like getting on a boat to the island and walking to the island. I guess I was designing landscapes that I felt would be really cool to visit. I love climbing, and north of Ullapool you’d see these little teeny lakes with rocky outcrops in the middle with trees on them. 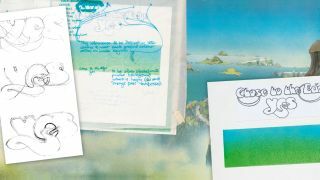 Roger Dean’s Islands and Bridges Exhibition is currently running at the Manx Museum on the Isle Of Man. It’s open until November 19.